Accounting 5 Edition Students get accounting when using Kimmel Accounting with WileyPLUS because we make learning accounting easy and accessible for today’s different types of learners. Written in a concise, clear, and conversational way, Kimmel Accounting provides just the right amount of information students need to come to class prepared. With powerful visuals, interactive tutorials, and problem solving videos, Kimmel Accounting makes complex accounting concepts possible to absorb quickly. Starting with the big picture of financial statements, Paul Kimmel shows students why financial and managerial accounting is important to their everyday lives, business majors and future careers. Students using WileyPLUS do real accounting, get real results. With automatically graded practice and homework assignments, and over 2 hours of video based resources per chapter, students come to class prepared and ready for quizzes and exams. With access to 1,000 practice CPA exam review questions powered by Wiley CPAexcel, students check their intermediate accounting knowledge against CPA exam standards. With internship listings powered by AccountingFly, students have a two-week head start on applying to accounting internships across the country. 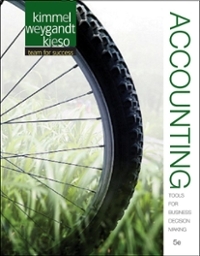 WileyPLUS for Intermediate Accounting 15th Edition prepares students for success in the course, and in the profession. WileyPLUS is sold separately from this text.